UPDATE – November 8, 2016 – Although the official switch off date is not until Wednesday the 9th, Entrez and BLAST are NOT currently working from MacVector 15.0.3 and earlier. We suspect this change is now permanent. UPDATE – November 7, 2016 – We have just been notified by the NCBI that they will be making the server changes that will prevent Entrez and BLAST from working on any version from MacVector 15.0 and earlier this Wednesday, 9th November, NOT the 1st of December as we were previously told. The NCBI hosts one of the world’s definitive sequence repositories and MacVector gives you direct access to sequences from these databases. Unfortunately, due to recently announced major infrastructure changes at the NCBI, MacVector’s ability to access these services will be severely impacted from December of this year. These changes are completely out of our control, however, our developers have been hard at work to resolve this. We are pleased to announce that we are about to release a new version that will restore this functionality: MacVector 15.1. 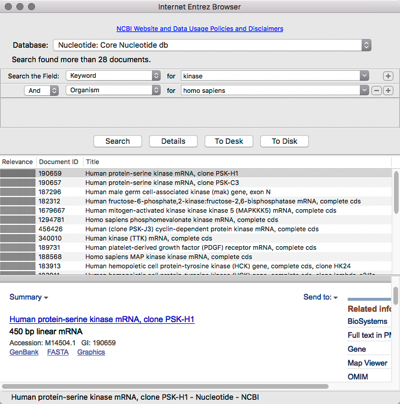 MacVector gives you access to the NCBI’s Entrez database. This allows you to search for and retrieve sequences directly to your desktop. Both simple and complex queries are allowed. For example, you can search for all human kinases and specific accession numbers. MacVector also allows you to perform Blast searches directly from your desktop against the NCBI’s BLAST database. From example, you can submit a protein or gene sequences against published sequence databases, or even a reverse translated protein against DNA databases. You can very easily retrieve any hits directly to your Desktop as well as view the alignments. Both of these tools directly access the NCBI’s databases via services that the NCBI offer. From September to December the NCBI are making two major infrastructure changes that will impact MacVector’s use of these two services. In September the NCBI are moving all their web servers to HTTPS only and in December they are switching off the HTTP web servers. These changes have been implemented in a US government wide change to ensure safe access of websites for all. HTTP is insecure and HTTPS is much safer. The US government website explains this further. From September onwards, they are gradually transitioning the way sequences are referenced, and therefore retrieved. Previously upon submission every sequence was assigned a GI number (since 1994) as well as an accession number. An accession number never changes, but with a new version of a sequence submission the GI number would change. From September 2016, all new sequence submissions will be assigned a single number instead. This will be the accession number AND version combined. The redundant GI number will no longer be assigned (although it will be a long time until older sequences have this replaced with the new version). The accession number and version will always be read together so you now have a simpler way of referencing a sequence, and more importantly, a human readable way of determining the version. NCBI Toolkit and Entrez Programming Utilities. There are two toolkits that the NCBI offer for accessing these services from within a software application. NCBI Toolkit and Entrez Programming Utilities (E-Utils). The NCBI have released a new version of E-Utils that supports HTTPS connections and ACCESSION.VERSION numbering. However, NCBI Toolkit is not going to be updated. MacVector 15.0.3 uses NCBI Toolkit and this unfortunately means that from December MacVector 15.0.3 will no longer be able to access ENTREZ or Blast. This change was announced with only a short notice and since the announcement our developers have been working extremely hard to migrate MacVector to use E-Utilities. We’re pleased to announce that this will be released shortly. MacVector 15.1 contains a whole new implementation of the BLAST and Entrez tools. MacVector 15.1 will be released very shortly a few months before the final switching off of these services. To avoid any interruption in service, please ensure that you have downloaded and installed MacVector 15.1 before the start of December. Although our hand has been forced somewhat with the release of MacVector 15.1, we are still planning to release MacVector 15.5. Since the Blast and Entrez tools have now been rewritten, expect to see even more new enhancements to these tools in future releases. This entry was posted in Releases and tagged BLAST, entrez, ncbi. Bookmark the permalink. Both comments and trackbacks are currently closed.